Club Penguin Cheats by Mimo777 Club Penguin Cheats by Mimo777: ** NOW OVER** Mimo's Club Penguin What's Different Contest 2011! ** NOW OVER** Mimo's Club Penguin What's Different Contest 2011! I really like the new Club Penguin Stadium! Everyone always likes my "What's Different" Contest so let's do this thing! 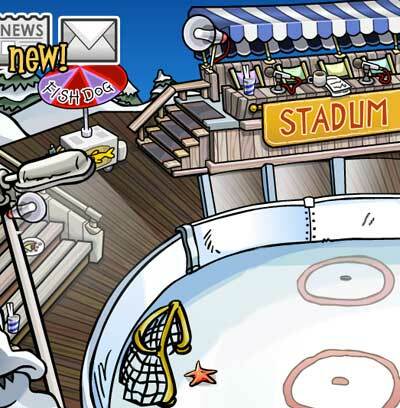 I have changed 10 things about this picture of the new Club Penguin Stadium. Can you find it? See if you can spot 10 differences between this picture below and the real Club Penguin new stadium! A couple are really hard, most are easy. Some of you will get them all. Some of you won't. Leave a comment and list all 10! And see if you can do it without cheats. Whatever that means. See if you can be one of the top 50 posting the correct answer! I'll post the right answers in a couple days. Yours is like darker than mine. its really hard i can just find 8!! @MuddyDuky Same with me! The color is different! OMG?!?! I though i found 8 but i found 9 lol 1 more! i hate wheni cant find it and then i find it... i get soooooooooo mad at myself .. I think i found it all lol i hope i did! i only found 8 i tried really hard.or is it a trick!? Wow Mimo! This is pretty hard. I can only find 9. Just 1 more! C'mon! Can I say them in this comment or somehting else? Hey Mimo! There are new trees in the town! There is one big tree on each side now! Could be an opening for the new room? All you have to do is right it all down on a piece of paper and ship it to Mimo ( You have to pay for shipping ) O.K I was just kidding about that part but all you have to do is write it in the comments then Mimo will read it but he won't post the comment so it will be totally fine to put all the answers on the comments. Make sure to have your Club Penguin Name or else Mimo won't be able to know who you are and then he wouldn't be able to post your name on the weiners list. HOPE THIS HELPS!! i found them all and told iot to mimo777 dont worry guys im sure you can win to its not that hard look very closely! I submitted all the right answers but my name isn't on the winners list. Why is that? Yay! Thank you Mimo! You are the best! I have found them all! Number 10 was hard! When you publish a comment it doesn't get automatically posted. It goes to Mimo and he checks it to make sure the answers are right, then he doesn't post it because he knows people will copy! So your safe to publish the answers because no one else will see them! Mimo I found them all!!!! All ten, took me a while but I did it. I'm not going to say otherwise people copy. I did find them all!!! NOOOOOOOOOO mimo its not fair i had one more and i couldnt right it down bc i had to go bed... make it more then one day! now can u tell us wat was number 10!? congrats and mimo theres a mega card jitsu water pack! its $9.99! Great job winners! I'm not going to say who it is, but one of my friends is a winner! yay i finally got on ur website! I know the answer the STADUM, near the goal there is no line and a star fish, the stairs ball, on the light there is a loudspeaker and the HOTDOG. AUSUM! I am wiener #30! I feel so special! Congrats to all the other wiener dogs and better luck next time to the other peeplz! I am speechless (in other words, I ran out of stuff to say). It's the starfish thing on the ice, right by the goal.